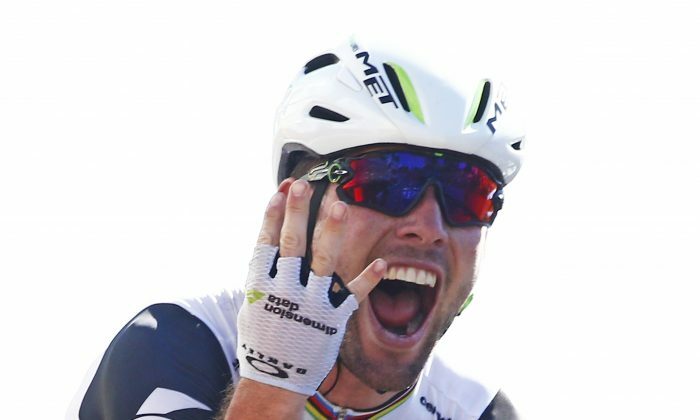 Dimension Data sprinter Mark Cavendish scored his fourth stage win of the 2016 Tour de France and the thirtieth of his career by beating Marcel Kittel in a slightly controversial sprint at the end Stage of Stage 14. After a few lackluster seasons, Cavendish has shown form this year he hasn’t has since 2009, when he won six stages. This win gives the 31-year-old Manxman a solid lock on second place in career Tour wins behind the legendary Eddie Merckx, who has 34—and Cav has another several seasons of racing in his legs. The 208.5 km stage from Montelimar to Villars-les-Dombes was a sprinter’s stage all the way, despite three Cat 4 climbs along the way. A four-rider break: Cesare Benedetti (Bora-Argon 18,) Jérémy Roy (FDJ,) Alex Howes (Cannondale-Drapac,) Martin Elmiger (IAM Cycling) stayed away until the final 14 km when Howse dropped. Benedetti dropped off at 9.3 km, and the remaining two were caught 3.6 km from the finish. Cofidis, Etixx-Quickstep, and Lotto-Soudal fought for control of the peloton, with Lotto in the lead under the flamme rouge, the 1-km banner. Direct Energie’s Bryan Coquard, Katusha’s Alexander Kristoff, and Cavendish were all forced to wheel-hop, which actually worked well for them. Etixx took over with about 500 meters to go, with Cavendsih on Kittel’s wheel. Kittel started his sprint about 220 meters out, possibly too early given the strong headwind blowing down the finishing straight. Cavendish came around him on the left, with Kristoff on the far left and Tinkoff’s Peter Sagan pushing up the middle. Kittel might have drifted a bit to his left coming around a slight right bend about 100 meters out; Cavendish drifted a little to his right, but he was already outpacing the Etixx rider. Alexander Kristoff crossed the line in second, an inch or two ahead of Peter Sagan, who added to his lead in the sprinters’ green jersey competition. Giant-Alpecin’s John Degenkolb, coming back from a hand injury early in the season, took fourth and Kittel finished fifth.